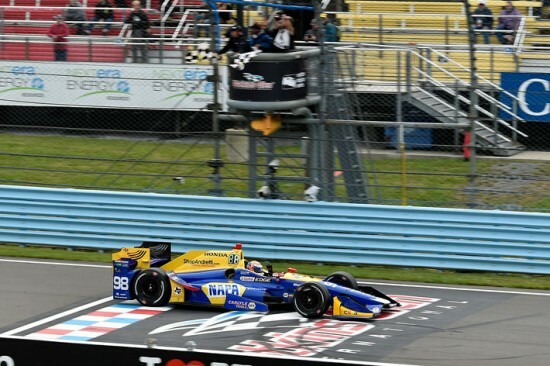 Alexander Rossi led a 1-2-3 Honda sweep of the podium Sunday at the INDYCAR Grand Prix of the Glen, with Scott Dixon making a massive gain in the drivers’ championship standings following a second-place finish and Ryan Hunter-Reay rounding out the top three at Watkins Glen International Raceway. Starting from the pole, Rossi was the driver to beat throughout the 60-lap event, despite having to make an extra pit stop when he failed to receive a full load of fuel during his first scheduled service, due to an issue with his pit equipment. In addition, the threat of rain and a pair of early-race caution flags led to a half-dozen cars going “off sequence” with their pit strategies, including the Chip Ganassi Racing Honda of Max Chilton. Fortunately, the second caution enabled Rossi to close the gap to the leaders, and effectively took him off sequence, as well. Once in the lead group, Rossi was both able to conserve fuel (running stints of 18 and 17 laps, respectively), and still led a race-high 32 laps. For his part, Dixon was also strong throughout the Watkins Glen weekend, qualifying second and running down all of the off-sequence drivers to climb from seventh back to second in an impressive run from between Laps 34-40. Dixon closed on leader Rossi in the final laps, but came up just one second short at the checkers. But the runner-up finish moves the four-time series champion to within three points of leader Josef Newgarden with just the series finale at Sonoma Raceway – where double championship points will be awarded – yet to run. Of the leaders, Ryan Hunter-Reay and Graham Rahal made some of the biggest gains through the race. After starting seventh, Hunter-Reay finished third, his best result since a second place finish at the second Detroit race in June. Rahal, meanwhile, finished fifth after starting 10th, his sixth top-five result of the season. Rossi’s victory is the seventh of the season for Honda, from six different drivers and representing every Honda-powered IndyCar team. Other winners include Takuma Sato at the Indianapolis 500; Dixon at Road America; Rahal, who swept both rounds of the Detroit double header race weekend; James Hinchcliffe at Long Beach; and Sebastien Bourdais at the season-opening St. Petersburg round. Today’s result for Honda is also the manufacturer’s best overall result since Indianapolis, when Honda drivers claimed four of the top-five positions, including winner Sato, with Ed Jones, Chilton and Tony Kanaan finishing third through fifth, respectively. Video recaps from this weekend’s Honda IndyCar Series action at Watkins Glen International Raceway, as well as Acura Motorsports activities from the Circuit of the Americas, are available on the “Honda Racing/HPD” YouTube channel. Produced by the Carolinas Production Group, the video packages can be found at: https://www.youtube.com/HondaRacingHPDTV. In two weeks, the Verizon IndyCar Series concludes its 2017 season with the GoPro Grand Prix of Sonoma, September 17 at Sonoma Raceway, just north of San Francisco, California.